Members of the new Independent Alliance meet at council HQ. Ten former Labour councillors have formed a new political force at North Lanarkshire Council with elections just four months away. The Independent Alliance are confident they can have a “significant” influence as the authority gets ready to make crucial budget decisions. The group’s formation comes after a year of turmoil for Labour following Jim McCabe’s resignation as council leader. 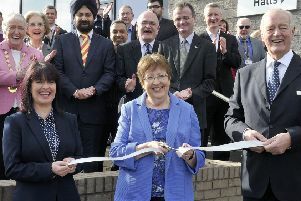 He was replaced by Jim Logue who angered some colleagues by replacing long-serving commmittee conveners with new faces. Several Labour councillors quit the party then and more followed later in the year during the process to select candidates for the council elections. Councillor Helen McKenna, deposed as convener of environmental services, and former housing convener Sam Love are among those who have joined the group. It also includes former depute council leader Jim Smith and former provost Tom Curley. The defections of the last year mean Labour’s majority has disappeared although it is still the biggest single group, holding 31 of the 70 council seats. The SNP has 22 and, apart from the Independent Alliance, there are another six Independents while Alan O’Brien stands under the Cumbernauld Independent Councillors Alliance. However, the Independent Alliance insist they are not out to make political mischief. Group secretary Gary O’Rorke, who quit Labour two months ago, said: “Given Labour are now in the minority, we have significant influence in committee and council decisions, but we are willing to work with others within the council for the common good. The other group members are Peter Nolan, Frank McKay, John Higgins, Jim Brooks and Peter Sullivan. The Alliance are looking to put up candidates throughout North Lanarkshire at the elections. Before that they will have a say in budget talks, with Councillor Logue warning of cuts of £34.6 million if the council accepts Government spending plans.